Last Chance to Enter Your “Funniest” or “Most Functional” uses for the Sweater Sampler! Just wanted to let you know, Jackie is honored to pick the Sweater Sampler Contest Winners! 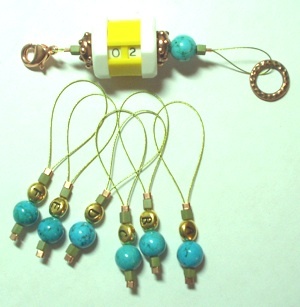 I will collect up entries this Friday, 4/16, when I am in the shop in the afternoon. If you can’t get in, but would still like to enter your ideas, email me with them, and I will get them to Jackie for her picks! Again, the contest – pick the “Most Functional” and/or the “Funniest” uses for the Sweater Sampler. 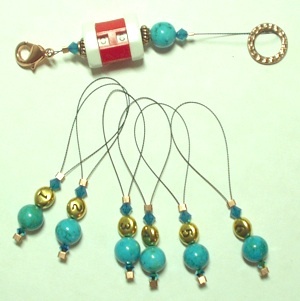 Winner receives a beautiful set of beaded stitch markers handmade by me! See photos below!